Clarence Kayak Trail is a waterproof/tear-proof brochure folded to A5 size that provides eight maps of coastal paddles around Clarence for beginners through to advanced kayakers. The publication gives highlights for each map and descriptions of potential hazards, and includes a paddlers checklist and safety information. 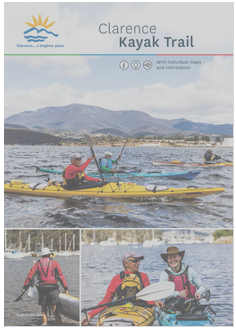 In a first for Tasmania, the Clarence Kayak Trail provides information to help kayakers plan their trip and make the best decision about where to go. The trail is divided into nine coastal sections to explore from Risdon through to South Arm. Each trail includes information about the estimated distance and skill level required, what to see along the way, launch points, hazards and warnings, and facilities to access off the trail.